Hello! It's me! I'm back in blogland! Refreshed and rejuvinated and lots of fun things to show you over the coming weeks. First up to celebrate my return after being away for ages and ages I thought I'd share a quilt that seems to have taken me ages and ages to finish. It all started with one of those days where I just felt like doing some easy sewing with my sewing machine. 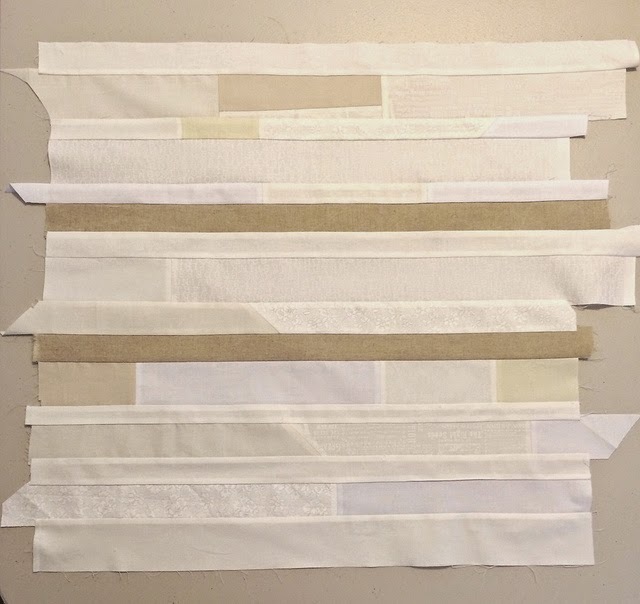 I dug around in my scraps and pulled out some leftovers from my Dollop Of Cream quilt. 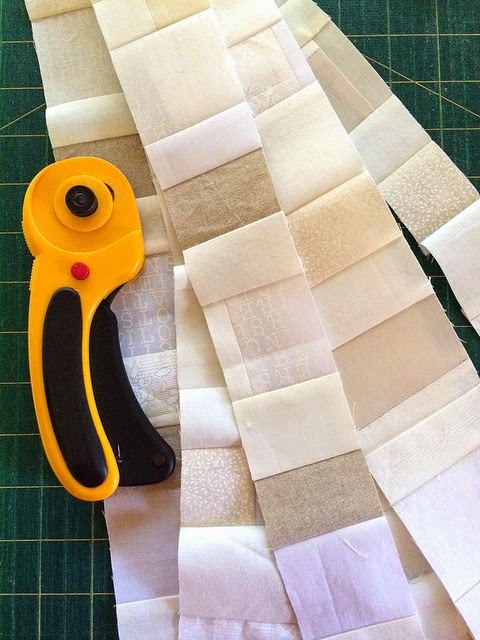 I simply sewed the pieces into strips then sewed those strips into a rough square. ... mixed up the rows and sewed them back together. It was hard to capture the right colours of this creamy mix of fabrics so I took it outside to take photos in natural light. The blue sky decided it wanted to be part of the quilt, or maybe the little flimsy thought for a moment that it was really a cloud. In my typical way I became distracted by other projects so the little fabric cloud was put aside for a while. Finally the day came when I decided it was time it was quilted. My first thought was to keep it simple, so I machine quilted by stitching in the ditch. It actually looked too simple so I pulled out the stitches, took a deep breath and then started again with my favourite organic chunky perle thread quilting. But somehow I just didn't love it. I kind've liked it but felt it needed something else. I tried a few different things but in the end the little pale quilt was put aside again. I've learnt by now that sometimes you need to walk away for a while until you can return with a fresh perspective. A few weeks later I was tidying my sewing room and I came across the little quilt. It was lying nearby a skinny off-cut of linen. Eureka! It was just what the little quilt needed. and the first circle became a sun. And indeed the sun showed it's shiny glow of approval when I was taking photos. ... Winter Sun, Don't you think that's the perfect name? Yes, that is a perfect name! I love all those little seed stitches scattered around the centre and then cross stitches too! Lovely to have you back too! I've missed you! Love love L O V E the quilting, it is so randomly awesome. Welcome back - and it's wonderful to see your process in action too. Love the name you chose! I've just dug out a WIP quilt which has been put away since January and now I love it all over again. Welcome Back! I was so glad to see a post this morning. Very cool new quilt. I love how you are always willing to do something unique and new. The stitching on this piece is wonderful! The name is PERFECT - I also like that it is small I bet it will look great on the wall. Funny how thoughts churn and build in our minds and a beauty us created. It really turned out GREAT! Hi Eachael....you are so inventive with your quilts! It's a perfect name as are those Magnolis coming into bloom...just beautiful! I am so glad you are back and you came back with a bang! What a super inventive quilt! I love how you tied the strips together, it gives it even more texture. I love the name....are those magnolias? I missed you Rachael! Welcome back! Winter Sun is beautiful.. It has warmth of the wood burning fire place as well as the wintery calm to it. Love all the stitching that went in it. To me they represent the amber flying out into the atmosphere. Little 24 inches packed with lot of stitch love! What a lovely quilt. Such different colours from your latest works. The name is perfect. 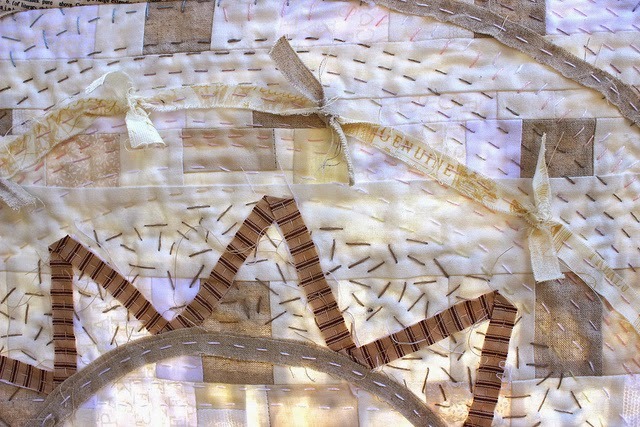 It epitomises the spirit of quilting, making use of scraps and the pattern evolving as you went. Welcome Back! What a fun little quilt. I loved reading about your process -- good for you for sticking with it! The name is perfect for this wonderful quilt!!!!! What a nice surprise to see you this morning! Welcome back.....Winter Sun is off of my favorite Dolop so I love it! 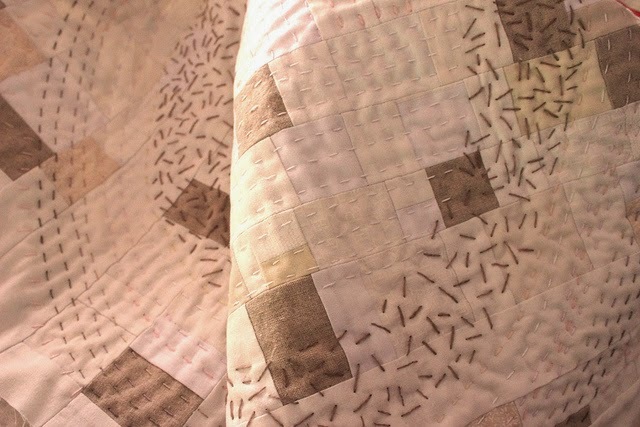 I'm going to have to try stitching a quilt that way some day, I always admire the ones that are. Welcome back! The story of this little quilt is such a good lesson for all of us. Sometimes, things need to sit undisturbed until everything comes together. It's hard to do in practice! I'm so glad you listened to your own advice. The outcome is wonderful! you know what... I'm trying to complete one of the beautiful houses you sent me a few years ago..I'm adding a few pieces here and there and hope to make a small wallhanging. You've definetly been missed. Winter Sun is awesome. Looking at your first photo I never would have guessed how you did it. I love your free spirit! It's good to see you back! 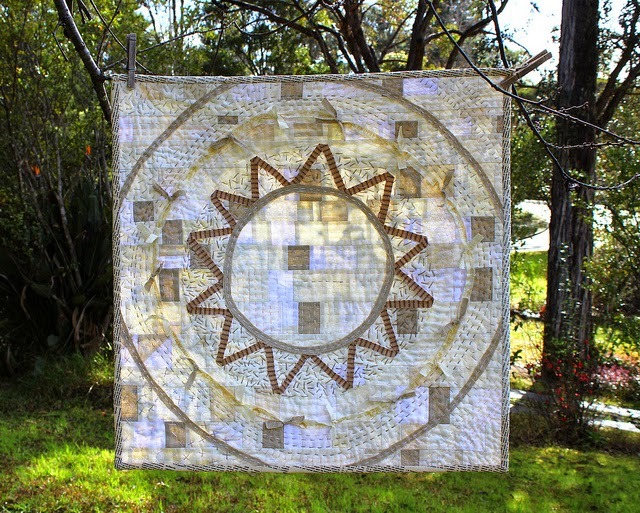 You found the perfect name for this quilt - the applique and those seed stitches just bring the background alive, but at the same time the whole thing is very calming. Beautiful! Welcome back Rach. So lovely to see you! I hope you enjoyed your hiatus. Another very innovative piece from the house of Blue Mountain Daisy! Very creative and different but oh so sweet! Welcome back. I do hope your blogging break was beneficial. 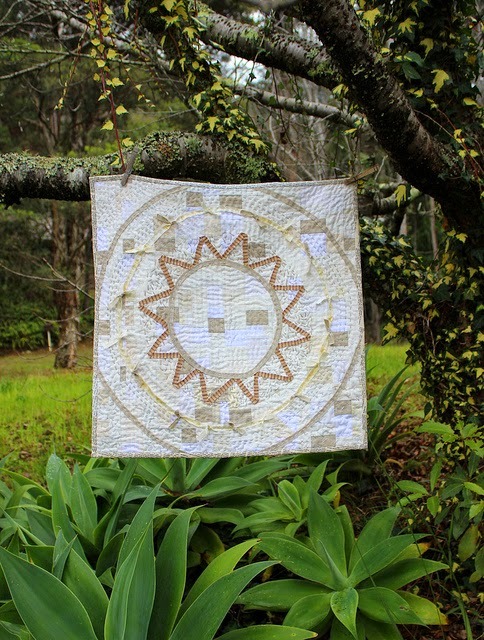 Winter Sun is a perfect name for this lovely quilt. I enjoyed reading your journey in its making. 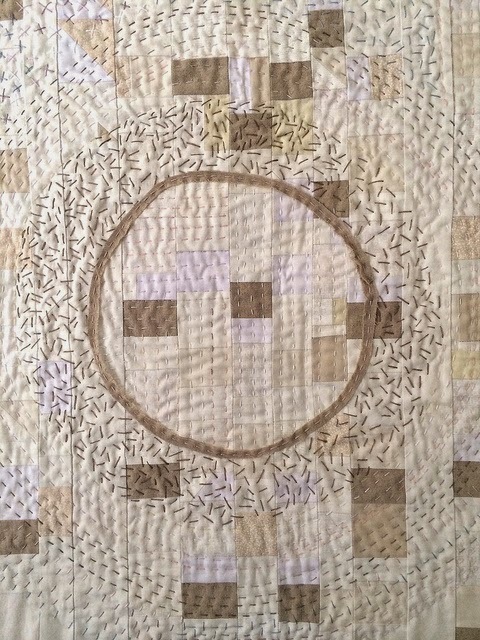 I especially love the circles you have created with the stitching. So pleased you are back blogging. I've missed you! 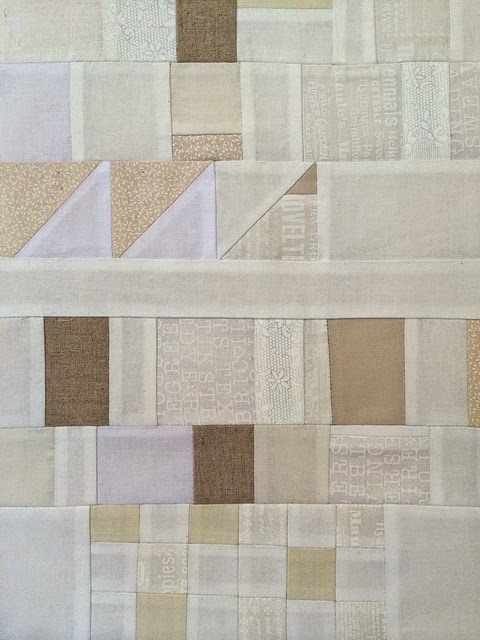 Love the cream quilt. Loved reading about your process creating this little beauty. I was amazed to find it is 24" square. It looked a lap sized quilt in the photo. Photos awesome as always. Looking forward to seeing what else you have been doing. You have had a Winter break and I seem to have had a Summer one........ very little sewing and no finishes for weeks. A perfect name for a gorgeous quilt! It is the perfect name and those stitches are just beautiful. I love the crosses! We have had some blissful rain lately. Joy. 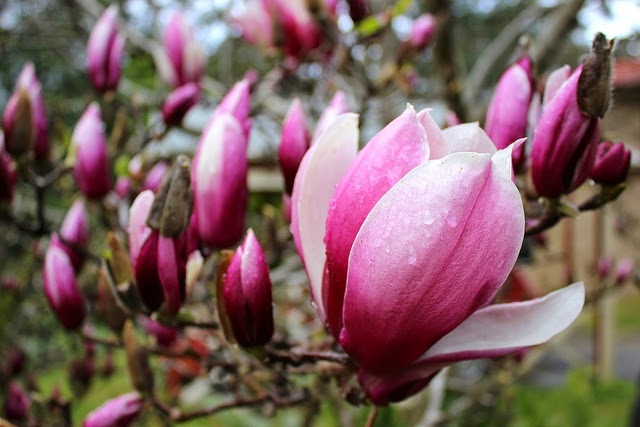 is your magnolia still flowering. My Nan used to say that as soon as her magnolias flowered there was sure to be a strong wind to blow all the flowers off. 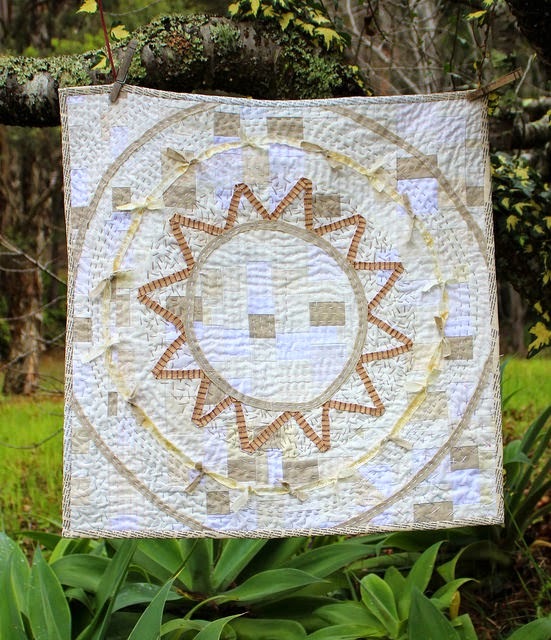 I don't have the right words to describe how much I love your Winter Sun quilt. I think the dimensional applique and quilting are just so perfect. So glad you enjoyed your break. I do like your Winter Sun - lots of fun techniques in that one! Lovely to have you back - so glad you're feeling refreshed and raring to go......! You are such a clever clogs! Such a good way to dress the quilt up and take it from okay, nice hand quilting to wow! Welcome back! 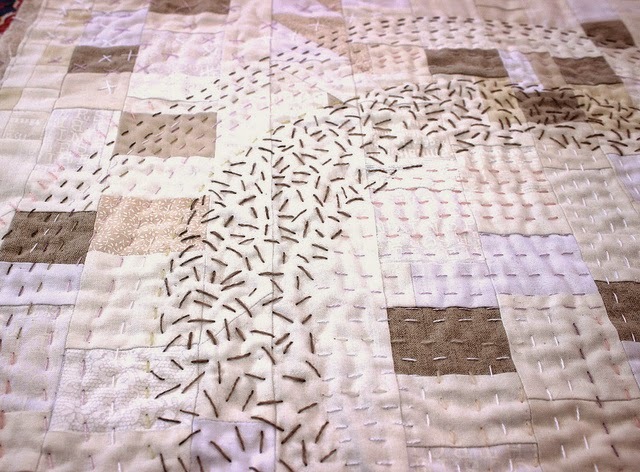 I love the scattered stitching on your quilt! I love how this quilt slowly showed itself to you. And so pretty, well worth the wait. 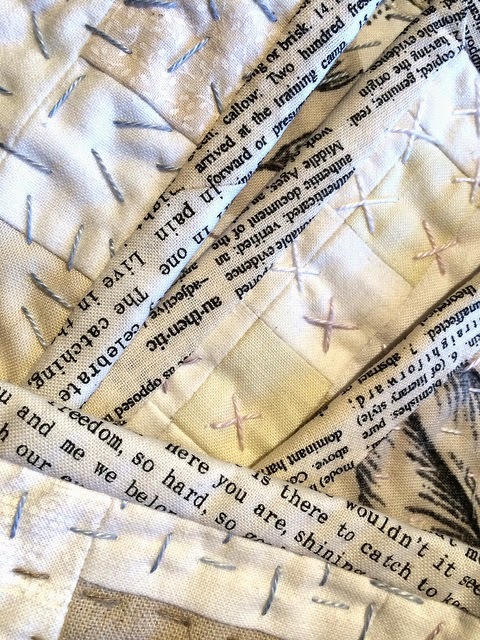 Your hand stitching is beautiful -- I think we should see a RachaelDaisy book coming out soon! fantastic! wow did that change the look! it just kept getting better and better! Lovely to hear from you again Rachael. 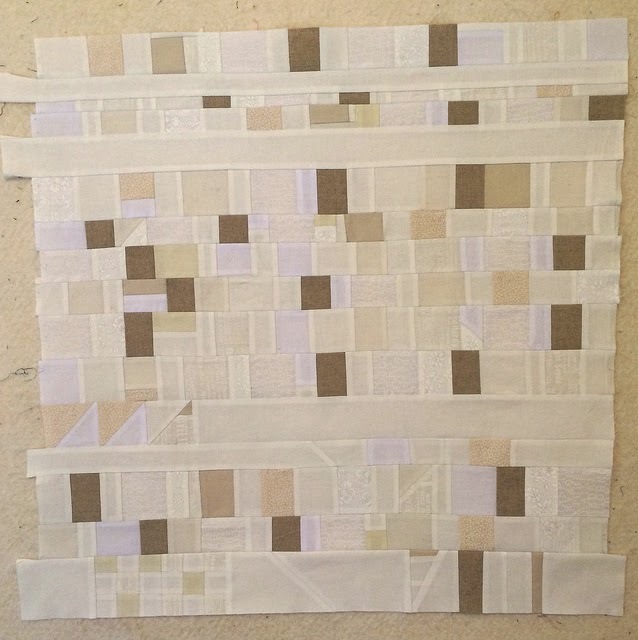 It was fun to see the process of how your quilt ended up as it is. Love the quilting. Love seeing your creative process, so inspiring. It is the art that gives me strength. So clever are you and this piece. You have captured the qualities of the Winter Sun so insightfully...the thinness, the subtlety, the fragility. It is kind and benign. We treasure it and revere it for we know in summer it will be smiting and blasting the earth and us. Well done you...you get me thinking everytime I see one of your quilts. It is like going to the Gallery. I am so glad your back, I miss your posts. you always inspire me in different ways. I love this little quilt and the quilting is just wonderful. love the name it is perfect! Springtime indeed! I like what you did with the wonderful whites and neutrals. 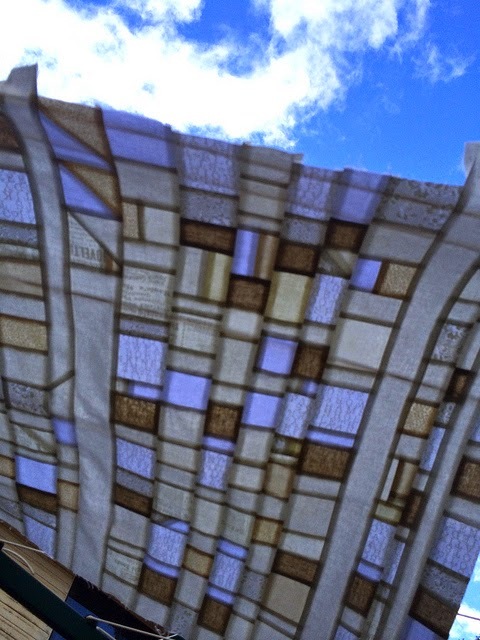 Your flimsy cloud picture looks like the Korean patchwork called pojagi (bojagi) that hangs in the windows. I'm working on a couple pojagi inspired quilts. Beautiful stitching and beautiful quilt. So very creative. I'm SO glad you are back! So glad you are back! I think that is the perfect name for your quilt. 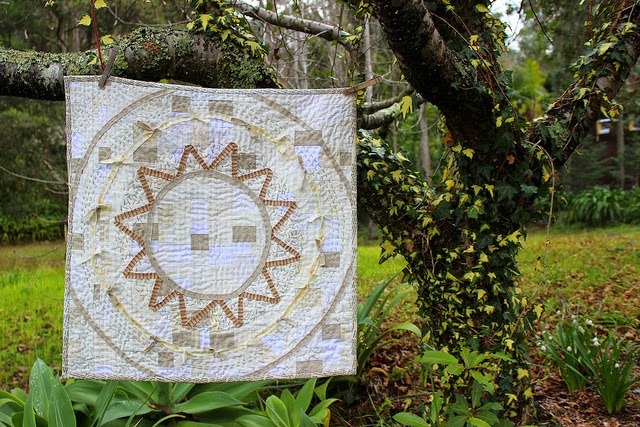 What a gorgeous take on a low volume quilt! It was so well worth it. Absolutely adorable.